I can't be bothered to grab my camera every time a moose passes by, but over this past weekend I couldn't help snapping a picture of this yearling as he crossed our backyard. 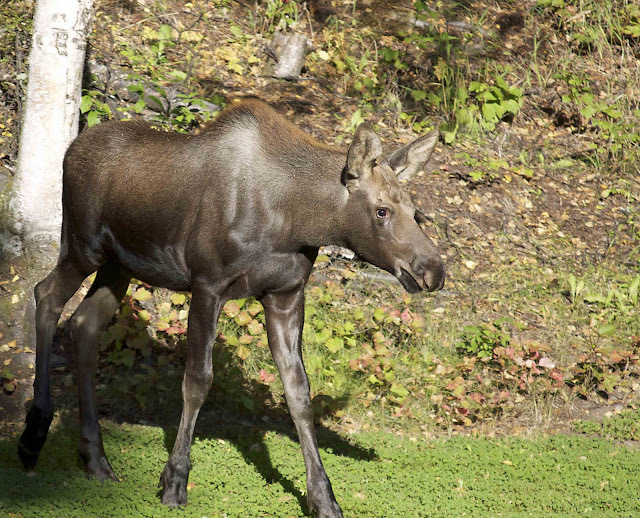 We were all outside playing in the sunshine—kids yelling and laughing, Daisy yapping away—and our presence bothered the young moose so little that he sauntered right on through the middle of our badminton game. I'm surprised he didn't pick up a racket and start playing. Ahhhh. He is just a little baby. Look at those eyes; curious little guy. But maybe a little scared too! I will never again complain of the little piles of whitetail deer poo in our yard. Those things scare me. Oh wow, that is so cool!! I can't believe that seeing a moose casually stroll through your backyard is like an everyday occurence!! My kids would freak (in a good way) if that happened here. In CA, we get squirrels every once in awhile and that always brings such excitement. That moose is actually rather adorable...he totally looks like he's ready to participate in the fun! Wow! A moose in the backyard?! Now there is something you don't see everyday..unless you live in Alaska, that is! I grew up in Colorado and we would wake up to a herd of 150 Elk in our yard. Those suckers are the size of a hummer and very intimidating! Holy cow! (or I guess in this case, Holy Moose!) That's pretty cool. We live in an area known for its wildlife, but since we're in the 'burbs, most of the animals stay away. A coyote ran in front of my car on the way to work the other day. Since I was in the car it was neat to see. You know how much I love your moose pictures! This guy looks a little creepy, though. Wow. A year old moose is gigantic. I'd be mighty peeved if he tried to tiptoe through my garden. Fantastic post title! It pulled me right in, and the content delivered as well. Wow, I can't imagine what it would be like to have a moose encounter be as common as our encounters here with small black-tailed deer. Thank you for participating in the SITS B2B discussion at Blog Frog! I can't imagine living in a place where moose wander through the yard with such frequency that they don't merit individual photo shoots! I'm reminded of the painting my dad gave me called "the chocolate moose"